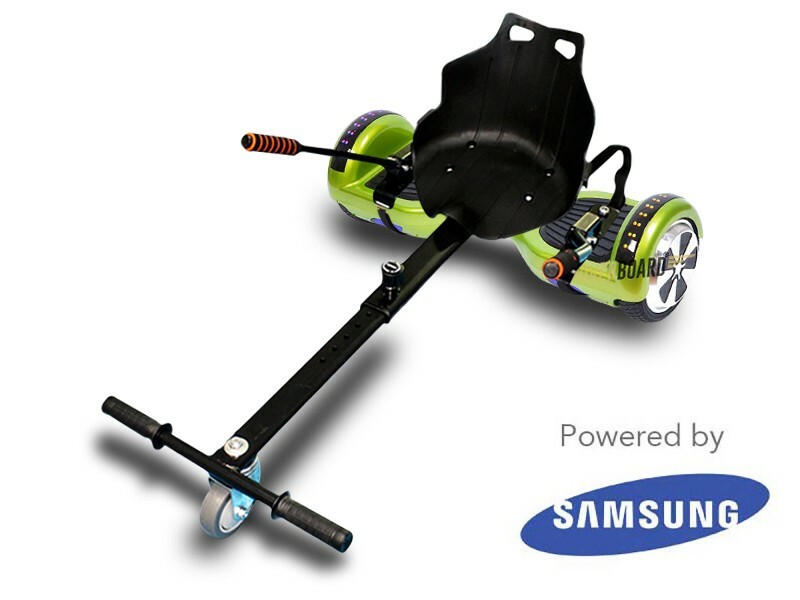 The Official Hoverkart by HOVERBOARD® is the ultimate addition to HOVERBOARD® Experience! Converting your HOVERBOARD® to a Go-Kart has never been easier. Within minutes simply attach the Hoverkart by HOVERBOARD® to your Self balancing scooter by HOVERBOARD® and off you go! The Hoverkarts by HOVERBOARD® do indeed offer a more comfortable easier balancing ride. The Hoverkart by HOVERBOARD® also has a solid plastic seating which can provide comfort as well as support when using the HOVERBOARD®. Another big feature of the amazing Hoverkart by HOVERBOARD® design is the sensitive hand-operation leavers which puts you in full control of the balancing board by HOVERBOARD®! The Hoverkart by HOVERBOARD® by will give you a garneted super smooth ride. The Hoverkart by HOVERBOARD® seating has an easy leaver to adjust the frame and seating position, so the Hoverkart by HOVERBOARD® can become suitable for both children and adults, furthermore as well as great functionality the bucket chair style is a race car inspired design. The perfect add on and gift for any HOVERBOARD® user. Furthermore, all our HOVERBOARD® products meet the applicable safety standards (UK) and are all certified and tested before they are shipped out. Please note that the HOVERBOARD® logo is not on the board and is only there for image copyright purposes. I really like the lime shade of green on this product, hoverboards have a put a lot of time and effort in the colour schemes of their product and it really shows, not only that with all the certifications and functions of each board it stands out fantastically compared to other suppliers of these products. I am mega impressed with the services the hoverboards guys provided me as well. Overall, it’s 5 stars from me! A great product at a great PRICE! Completed and finished nicely with a smooth and supreme service.